1Lt Cecil J. Gates (P) - Flew on all thirty-four missions as a Pilot. Combat tour completed on 07 March 1945. 2Lt Theodore T. Zapora (CP) - Did not fly on mission #271. Flew as a Lead Crew Tail Gunner/Observer on mission #293. All other missions as The 1Lt Gates Crew CoPilot. Combat tour completed on 07 March 1945. 2Lt Thomas E. Quinlan, Jr. (N) - Flew on the first nine 1Lt Gates Crew missions. Substitute Navigators used on all other missions. 2Lt Quinlan flew on eight additional missions (283, 291A, 298A, 303, 307, 309, 317 and on 28 Dec 1944 with the 381st BG(H) as a Lead Crew GH Navigator. 2Lt Harold F. Elliott (B) - Flew on the first nine 1Lt Gates Crew missions as Bombardier and four additional missions (280, 282, 283, 284) as the crew Navigator and five additional as Bombardier (300, 316, 323, 324, 331). Substitute Bombardiers and Toggliers used on the other 1Lt Gates crew missions. Flew on twelve additional missions with other Pilots as Bombardier (287, 291, 293, 296, 297, 325, 327, 329, 333, 337, 339 & 341). Combat tour completed on 20 March 1945. 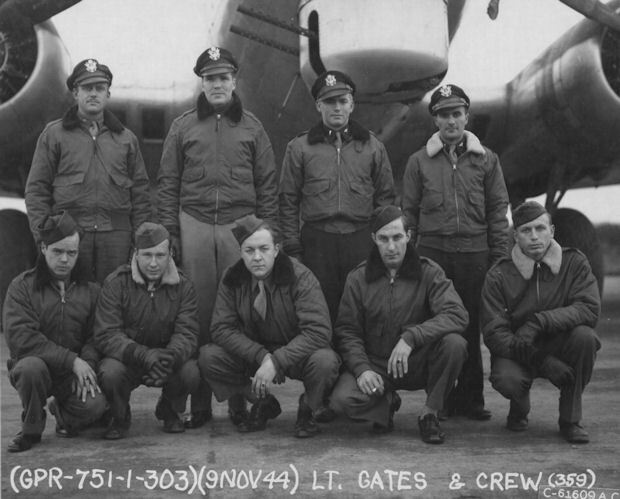 S/Sgt Walter Wysocki (E) - Flew on all of the 1Lt Gates crew missions except for three (313, 314, 316) where substitute Engineers were used..
S/Sgt Charles E. Maurer (R) - Flew on all of the 1Lt Gates missions except for ten (280, 290, 313, 314, 316, 320, 323, 324, 328 & 331) where substitute Radio Operators were used. Did not complete his combat tour. Sgt Charles R. Berrett (BTG) - Flew on the 1st six 1Lt Gates crew missions and removed from combat status. Substitute Ball Turret Gunners used on all other missions. S/Sgt Elton E. Wallis (WG) - Flew on 22 missions with the 1Lt Gates crew. No Waist Gunner used on four missions (320, 323, 324, 328). Substitute Waist gunners used on eight missions (274, 275, 286, 287, 290, 300, 314 & 331). Flew on two missions with other Pilots (303 & 306). Total 24 missions. Did not complete his combat tour. Sgt Chrissie D. Schrader (TG) - Flew on seven missions with the 1Lt Gates Crew (271, 282, 283, 285, 287, 292, 294). Flew on one mission (303) with another Pilot. Total 8 missions. Did not complete his combat tour. #273 (16 Nov 1944) - Returning from mission to Weisheiler, Germany in B-17G #43-38878 (No name) (359BS) BN-D. The 31 returning B-17s were diverted to RAF Satellite Station Sleep. 2Lt Gates was the 28th B-17 to land. He overshot the runway and the right tire blew when braking action was applied. This caused an obstruction at the end of the runway. 1Lt G.C. Newton, the 30th B-17 to land in BG-17G 42-97281 Queenie (427BS) GN-Q, also landed long and failed in a ground loop attempt. The left wing hit the right wing of parked B-17 #43-38878 (no name) (359BS) BN-D.
#300 (10 Jan 1945) - To Bonn/Brilon, Germany in B-17G 44-6502 (no name) (359BS) BN-G. Aircraft was hit by flak at the target and was losing altitude. The #1 engine was out and feathered, #2 was burning and #3 was windmilling. The interphone communication was inoperable. At the urging of 1Lt O'Dell (N), Lt Gates (P) turned west in an attempt to make it past Allied lines. There was 100% overcast below. The only working flight instrument was the Pilot's magnetic compass. The Navigator went to the waist to bailout the six enlisted crewmen and gave them instructions on the direction to walk in an effort to evade capture. After the enlisted men bailed out the four officers parachuted somewhere between Neufchateau and Florenville, Belgium. The B-17 crashed in Belgium. S/Sgt Walter Wysocki (E) and S/Sgt Emil Kayrallah (TG) were captured and killed by the Germans. Sgt Paul H. Hassler (Y-Operator), who feared for his life if captured, landed several miles south of St. Vith and was rescued by advancing Allied tanks after being overlooked by the Germans. S/Sgt Charles E. Maurer (R), Sgt Richard D. Duerr (BTG) and S/Sgt Christopher Tarnava (WG) were captured by German soldiers and became POWs. The four officers, 1Lt Cecil Gates (P), 2Lt Theodore T. Zapora (CP), 2Lt Harold F. Elliott (N) and 1Lt Benjamin L. O'Dell (B) landed in Allied territory and with the help of French speaking Belgians, members of the F.F.I., were reunited with American troops. They returned to Molesworth on later in January 1945.